Football season is almost over and it’s time for the big game!! Have a house full of hungry mouths and you don’t know what to feed them??? Wait a minute you can serve my Healthy Buffalo Chicken Fingers that everyone will love and be fighting for the last one. 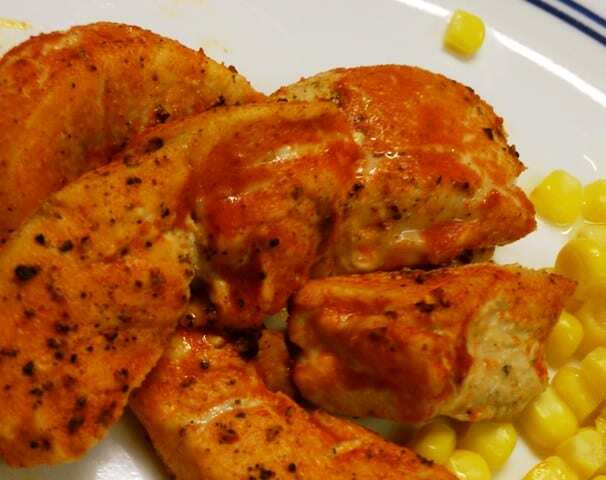 I have come up with some great low carb chicken recipes that can be made indoors or out. If you are at your house your stove will do all the work for you and all you have to do is pop them in the oven, dip them in the sauce when ready and back in the oven for a quick tv timeout on the field. If you are at the game you can marinade the chicken in the sauce and then throw them on the grill for a quick snack ready in minutes. I came up with this recipe with my family when we were craving wings but we didn’t want all the fat and calories. This is a no fail recipe that you will love and go back to even when football season is over. The great thing about this recipe is you can use any cut of chicken. The healthiest piece of chicken of course it the boneless skinless chicken breast which most people have in your fridge. Just make sure you slice it up to bite size strips or pieces but any kind of meat will work good to just make sure to cut off the access fat. Another great thing about this recipe is that you only need 5 ingredients to make this and not more than 20 minutes from start to finish. Also you can make extra servings and save it for a quick healthy lunch or a quick healthy dinner that just takes 5 minutes to warm up. Cut off any skin or tendon still left on the chicken breasts. Then slice each breast into bite size strips about ½ inch thick. Using the garlic powder sprinkle over the chicken strips. Next use the pepper and salt and add to the chicken. Place in the oven for 8 minute. At this time you want to pour the sauce in to a bowl that will be large enough to dunk the chicken into. Pull the chicken out of the oven and dredge it in the sauce. After the chicken is fully covered in sauce, place it back on the cookie sheet. Repeat till all the chicken pieces are covered. Back in the oven 6 minutes and then the broiler for one more minute.